Worth paying my brother Werner a visit! 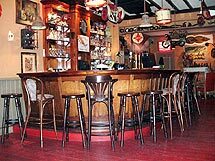 Having a well-served drink in the compagny of friends while you can enjoy the beautifull decorum of wallpaintings, miniature cars or motorcycles, old publicity material and objects from days long-gone ...some of those deco-pieces are even for sale! Another purpose is to keep «Live Music» alive! We present weekly Live gigs to you in the wide range of Blues/Rock, Country & Alternative Country, Bluegrass and Rockabilly in its every form possible.. In 3 words : ROCK and ROLL ! ... THAT is what we built our name upon ! After booking bands over more than a decade now, our name became a sort of a brand...a brandname that now is known in Europe, the USA and even Australia and Brasil ! ACE CAFE RUMST is the perfect location to invite your friends or family to, when you're planning a personal party (birthdays or so...) in a cosy atmosphere and some fine music! Talk to us and we'll make you a deal. You need some more info?